Song arrangements can be a useful feature in managing different versions of your songs in your database. For example, you can have custom arrangements of a song in Tithe.ly ChMS or different sequences of the song you wish to send to your music team to practice. In this case, simply add in a name of the default arrangement you wish to use. You’re able to create more arrangements when the song has been created – see how to create song arrangements in this link. Add a default arrangement to the song such as customizing the length, key and the name of the arrangement. Once the song has been created, you can also make any additional changes for the song settings, such as assigning the song for a Location or enter any notes for the song. On the sidebar, you’re also able to add in an arrangement, any files you want to associate with the song and see when the song has been scheduled for an upcoming or past service. Once the song has been added, click on the Song Title then ‘Add’ arrangement in the Sidebar. 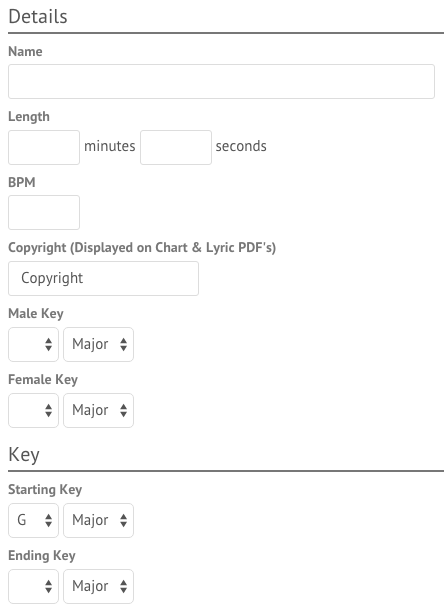 Add in a name of your arrangement and include a starting key for the song, otherwise chords will not be generated.